The Doom 4 2014 release date is the biggest rumor in the gaming industry right now. But no one knows much about the project other than a beta will be packaged with preorders of Wolfenstein: The New Order. Even then Bethseda isn’t talking very much because their FAQ doesn’t even say when the Doom 4 beta begins or what it’s focused upon. In a related report by The Inquisitr, we take a look at the available Doom 4 rumors and how ID Tech 6 might affect how the game is played. I’m paraphrasing here, but John Carmack famously once said Doom is all about shotguns and demons. It’s all about one lone warrior defending what’s left of the world against a horde of invading pinkies without needing to make quips like Duke Nukem. But it compared to recent series like Call Of Duty and Halo the gameplay also moved lightning fast in comparison, with action being fairly fast-paced and fluid. Even since Counterstrike, modern games have tended to slow things down a notch. So, really, ID software either has a choice of going full blown nostalgia while not seeming like they’re copying Serious Sam or Painkiller or they need to blaze a new path. Considering that multiplayer deathmatch have always been a huge component of any Doom game it seems obvious they’ll balance that out. But the single player experience is what makes me wonder. No, I don’t want a Call Of Doom game. Nor does copying the single player, open world hybrid model of Destiny seem like it would fit Doom. Personally, I wouldn’t mind seeing a focus on the horror aspect of the game. After all, the Resident Evil series has pretty much become an action game and I can’t recall a single game that’s really made me jump in ages. 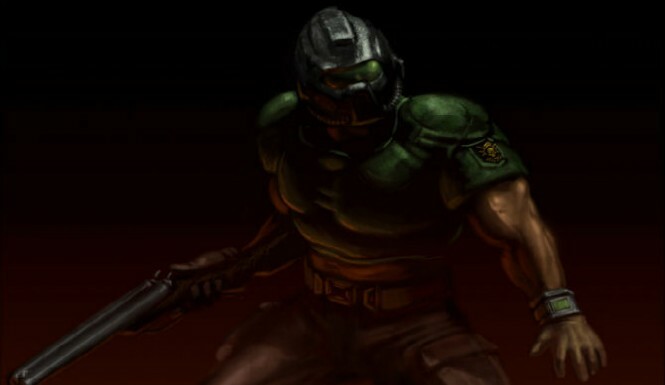 If Doom 4 was designed to be hard-hitting where both Doom guy and Demon are balanced out go down quickly from gunfire there may be a way to instill some fear in us gamers. What do you think?